The news is not unexpected given the RSA has pulled back on requiring a Public Services Card in order to apply for a driving licence. 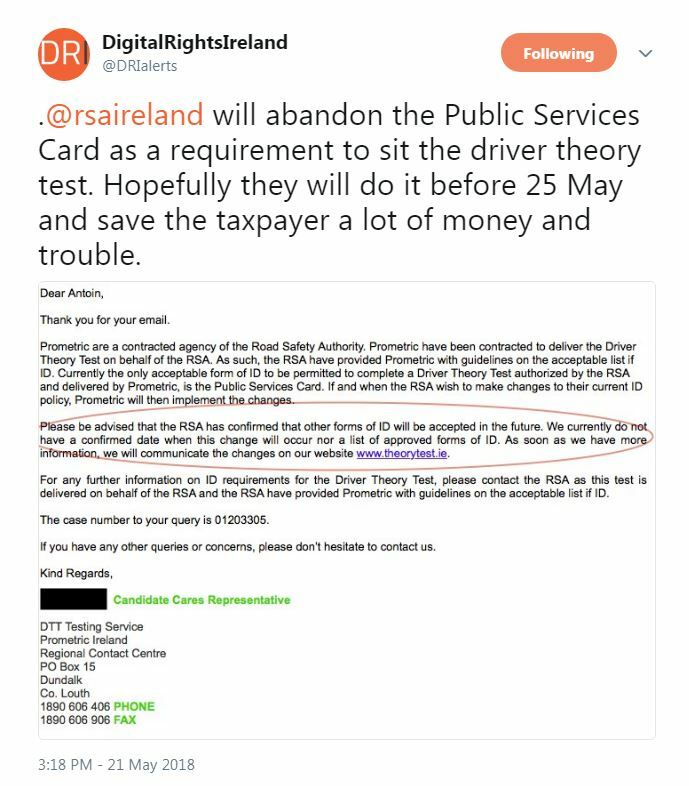 THE ROAD SAFETY Authority has confirmed that it is in the process of removing the Public Services Card (PSC) as a mandatory requirement for those seeking a driver theory test. The news was first delivered to data advocacy group Digital Rights Ireland (DRI) by Prometric, the Louth-based contractor that operates the theory test for the RSA. The news is not unexpected given the authority recently backed down on plans to make the card mandatory for those applying for a driving licence, after it emerged via the Attorney General that to do so would not be legal. “Please be advised that the RSA has confirmed that other forms of ID will be accepted in the future,” a Prometric official has told Antoin O Lachtnain of DRI. We currently do not have a confirmed date when this change will occur nor a list of approved forms of ID. An RSA spokesperson confirmed the news this evening, but stressed that no official date has been put in place for the requirement to be rescinded. “We will be aligning the theory test with the situation seen with driving licence applications,” a spokesman told TheJournal.ie. However, it is important to note that no date has yet been put in place for that to happen, and that for the time being the status quo will apply. For those applying for a theory test a Public Services Card will remain a requirement for the immediate future. The theory test became the first state function to be moved to the aegis of the PSC in June 2017, following the announcement that the card’s functions would be expanded from those of welfare services to those of multiple other statutory bodies in May of last year. “It’s clear the government has advice from the Attorney General that a PSC can’t be required to access public services,” O Lachtnain told TheJournal.ie. It was originally supposed to be a convenience, an extra facility to make things easier for the taxpayer. It was never intended that it would be compulsory, and what the RSA is saying really vindicates that. “Now only one agency remains, the Department of Foreign Affairs and the Passport Office. And they are in a similar position to the RSA,” he added. Last week, it emerged that the authority had spent €2 million on the project to migrate the driving licence to a situation in which a PSC would have been mandatory in order to apply for one, before Minister for Transport pulled the plug over the legal question on foot of advice from the Attorney General. Over 3.25 million PSCs have been issued since its introduction in 2012 by the (then) Department of Social Protection. Over €60 million has been spent on the PSC project to date. Email “It's official - the PSC will be pulled as a mandatory requirement for your driver theory test”. Feedback on “It's official - the PSC will be pulled as a mandatory requirement for your driver theory test”.